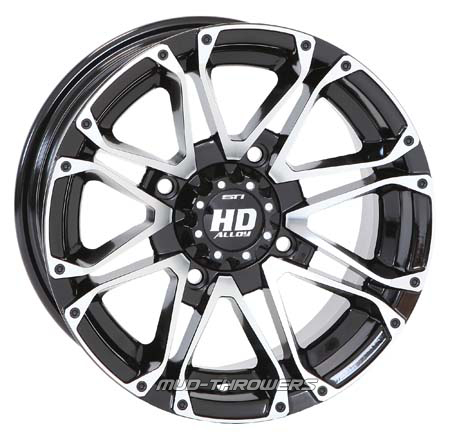 Introducing STI's stylish new addition to the proven HD Alloy wheel line - the STI HD3 Machined with Gloss Black wheels. This wheel is available in a machined finish with gloss black accents. Available for most popular ATV and UTV applications with a 12" and 14" diameter version. ** The 5+2 offset wheel (+30mm) keeps the factory stance width and offset close to most Polaris OE specifications. This offset is recommended for RZR 570 / RZR 800 machines looking to keep the 50" wide trail requirement. The 5+2 offset is also recommended for Sportsman 550/850 XP machines, RZR 900 and RZR 1000 machines to maintain good splash protection. The above part numbers are listed for your reference only to show all wheels available. Not sure about your bolt pattern? Click Here. Wheels are sold individually. Prices vary by wheel size, and start at $81.95. Center cap is included with each wheel! ​Please select your wheel application listed by part number below for ordering. If you do not see your application, please send us an email at info@mudthrowers.com. STI HD3 / HD4 Gloss Black Center Caps - 2 pk. 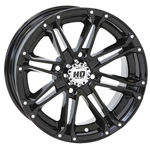 STI HD Gloss Black�Center Caps.� Fits�all HD3 machine wheels and STI HD4 gloss black wheels. Sold in sets of two. STI HD3 Chrome Center Caps - 2pk. STI HD3 Chrome Center Caps.� Fits�all STI HD�Wheels.� Sold in�sets of two.